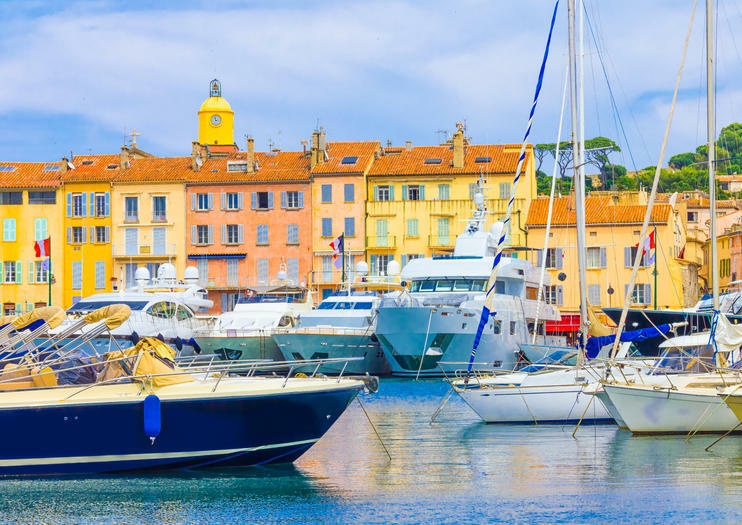 St-Tropez on the French Riviera is more than a hangout for A-list celebrities and European jet-setters—its historic old town, lively market, and coastline make it popular with day-trippers and cruise visitors along France’s Côte d’Azur. Here are the best ways to see St. Tropez from Nice. On a full-day group tour by road from Nice to St-Tropez, you might drive through the Maures Forest with a stop in picturesque Port Grimaud along the way. With your guide, take in the sights of St-Tropez, such as the yacht-filled old port, Notre-Dame-de-l'Assomption Church, the Citadel of St-Tropez (Citadelle de St-Tropez), or the Annonciade Museum. Some tours include an optional boat ride, with small-group and sunset tours available. Alternatively, take a seasonal spring or summer ferry from Nice to St-Tropez and enjoy coastal views as you sail along the French Riviera. Experience Port Grimaud and St-Tropez according to your interests by booking a private tour from Nice. Together with your guide, you’ll plan your day just as you’d like, which might include exploring historic houses and canal ways of Port Grimaud, stopping for photos along the Côte d’Azur, and strolling down the designer shopping streets in St-Tropez. Try a private tour of St-Tropez after dark to get a taste of the village’s nightlife. Full-day sightseeing tours typically last eight to nine hours. Bring extra money for meals and snacks. The drive from Nice to St-Tropez takes about two hours; the ferry ride lasts about two and a half hours. The market in St-Tropez is open on Tuesday and Saturday mornings. Depending on your tour, pickup is available from many Nice hotels. In case of hotel pickup, plan to depart 30 to 60 minutes earlier than stated departure time.